Is the Pharaoh Hound right for you? Find your perfect match now! The Pharaoh Hound looks like she could have jumped right out of a line of Egyptian hieroglyphics. This dog jumps like a deer, and runs like the wind. You wouldn't expect a dog so exotic, agile, and aristocratic in bearing to also be a complete goofball, but she is. 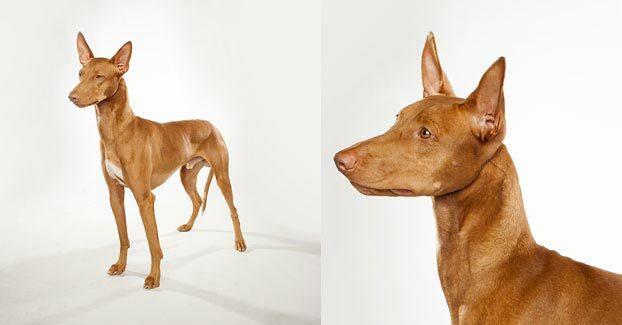 Pharaoh Hounds are also blushing beauties: when these dogs are excited or happy, their ears and nose turn a rosy pink. This ancient breed is originally from Malta, can grow to between 44-55 pounds and live an average of 12-14 years. The breed is recognized by the American Kennel Club and classified as a member of the Hound group. 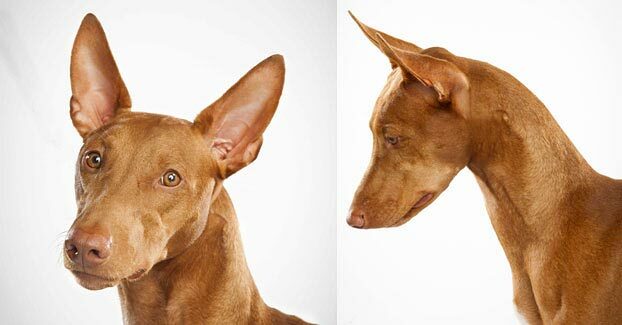 WHAT IS A PHARAOH HOUND'S PERSONALITY LIKE? These dogs like kids, but they can also be a bit rambunctious. The dog, that is. Well, maybe your kids too? (We don't know your life.) In any case, you should supervise their play. Pharaoh Hounds do well with other dogs, and can get along with cats if socialized with them early enough. WHAT IS PHARAOH HOUND BEHAVIOR LIKE? 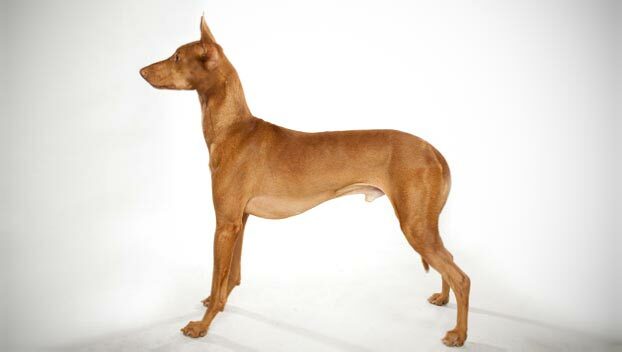 Pharaoh Hounds are a somewhat active breed who need at least half an hour of good exercise every day. They'll also enjoy some playtime in your very well-fenced yard. These dogs don't need to be with you every second; they like to know you're around, but they'll also make their own fun. HOW EASY IS IT TO TRAIN A PHARAOH HOUND? 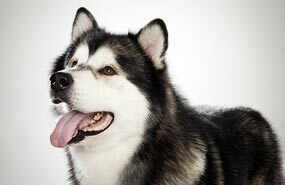 These dogs certainly know their own minds and can be somewhat resistant to training. If you can convince them that training equals attention, they'll be more likely to go along with it. This breed will never be excited to do the same task over and over though, so keep sessions short and interesting. She'll respond well to play, praise, and treat rewards. Be patient and consistent while working with this noble beast. Also beware of food left out. To be honest, the Pharaoh Hound is only noble and aloof when she wants to be: this breed is a notorious scrounger. Don't leave food out where she can reach it if you want to finish your own sandwich. If these dogs see something they want to chase, they'll be gone before you can say “pizzle stick.” They're definitely not good candidates for off-leash play outside a well-fenced area. And we mean well-fenced: a Pharaoh Hound can clear six feet without breaking a sweat, so be sure your enclosure is at least eight feet high. With their athletic build and intensity, these dogs excel at lure coursing, agility, tracking, rally, and even obedience, if properly motivated. HOW MUCH DO PHARAOH HOUNDS SHED AND WHAT ARE THEIR GROOMING NEEDS? A Pharaoh Hound's glossy coat is short and easy to maintain. Brush them once a week and bathe them as needed. They are infrequent shedders. WHAT HEALTH PROBLEMS DO PHARAOH HOUNDS HAVE? These dogs are generally healthy. Their skin can get dry and flaky in the winter. Some are also prone to hypothyroidism, skin or food allergies, or digestive issues. IMPORTANT: This breed may be sensitive to barbiturate anesthesia, so be sure to ask your vet about anesthesia prior to surgery. ARE PHARAOH HOUNDS GOOD FOR PEOPLE WITH ALLERGIES? The American Kennel Club doesn't list Pharaoh Hounds among its breeds recommended for allergy sufferers. You can reduce your furry friend's impact on your allergies with frequent baths and brushings to reduce loose hairs and aggravating proteins in your pet's dander. Use a damp cloth to wipe off your dog after you've been playing outside. Smaller dogs have less surface area, and so produce comparatively less dander than larger breeds — definitely something to keep in mind with a dog like a Pharaoh Hound! Remember that no breed is 100% hypoallergenic, and any breed can aggravate allergies. WHAT IS A PHARAOH HOUND'S BEST DAY? Pharaoh Hounds want to chase all the small furry things for as long as they can, then curl up in a sunny spot and take a well-deserved nap. SHOULD I ADOPT A PHARAOH HOUND? These dogs don't much care for the cold, but they don't mind the heat. They have moderate exercise needs and don't require much grooming. 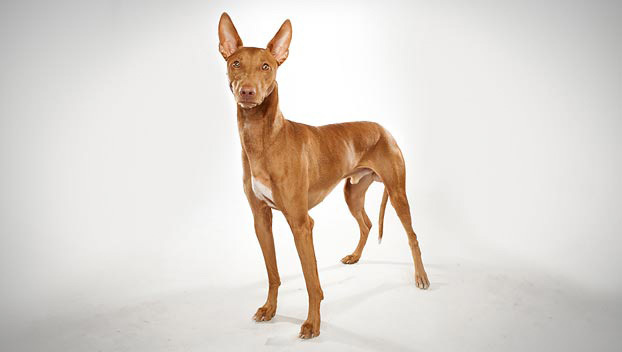 If you're looking for a striking, speedy canine companion, the Pharaoh Hound is one for the ages. 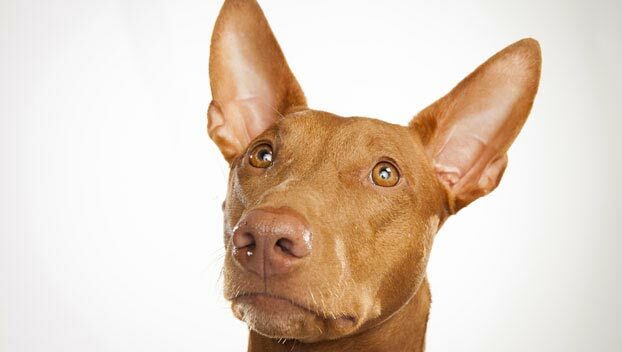 Have you decided that a Pharaoh Hound is the perfect dog for you? Why not be your new best friend's hero and adopt a rescue! Be sure to check out our article on what to expect when you're adopting a dog or cat.